Helmut Panke was a late arrival to the automotive industry, yet he turned up in time to be a part of BMW's rise as the ultimate symbol of 1980s "yuppy" excess. Mr Panke was in his mid-30s when he joined BMW as head of planning and controlling, leaving behind an impressive career as a university lecturer, nuclear research scientist and consultant. But what seemed like a good horse to back in 1982 would soon prove disappointing as the 1980s boom turned to bust - and as BMW's envy-provoking connotations sparked a serious backlash for the brand. 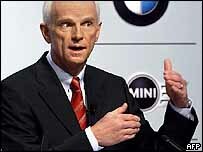 Mr Panke spent the next decade helping to rebuild the brand, firstly as head of corporate strategy and coordination and then as chief of BMW in the US, before he joined the group's board of management in 1996. A decade on, as chairman of the management board, Mr Panke is in charge of what has become the world's biggest seller of luxury cars, having recently overtaken arch-rival Mercedes. "On a global basis, Mercedes is the number one competitor," Mr Panke says, clearly pleased with last year's performance. During 2005, BMW Group sold 1.33 million cars, including models from its UK subsidiaries Mini and Rolls-Royce, putting it well ahead of Mercedes Car Group's 1.22 million Mercedes, Smart and Maybach models. 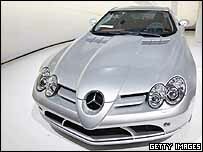 But DaimlerChrysler subsidiary Mercedes is hitting back. At the Geneva motor show, which opens next week, Mercedes will show off a broad range of supercars from its AMG division. The display of power threatens to outshine BMW's own revelation, a souped-up Z4 M two-seater coupe. But Mr Panke seems to relish the challenge. "Mercedes is the perfect competitor," he enthuses. "It has challenged and driven our people. If there was no Mercedes, we would have to invent it." 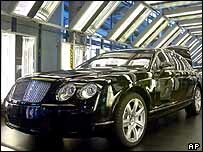 Panke: "It hurts how successful Bentley is in the market"
Mr Panke is not one to be caught on the back foot. His imposing personality perfectly embodies BMW's bare-fisted approach - seen not only in its lengthy fight with Mercedes but also in the car maker's push deep into Asian and US markets, which has helped its sales almost treble since its 1980s heyday. When it came to rebuild BMW's image during the 1990s, the car maker decided on a fresh approach. "We are much more focused, we are in a much clearer position than we were in the 1980s," Mr Panke says, pointing to the way the company has carefully developed an "independent identity to each model line", each with an almost cult-like following. "The cars must feel like a BMW, or a Mini, or a Rolls-Royce." Hence any Mini derivative must be "fresh, cheeky, cute", while a Rolls-Royce must be ultra-luxurious. However, BMW's strategy of slowly building loyalty and brand awareness has drawbacks. Panke: "The average UK tax rate of 22p would be 22.3p without BMW"
BMW currently has no presence in some of the fastest-growing and most profitable market segments in the industry - such as the one carved out by Bentley's successful Continental, a car BMW is unable to rival. "It hurts how successful Bentley is in the market," Mr Panke admits. 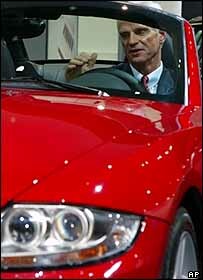 But he insists BMW's ultra-luxury subsidiary Rolls-Royce will win in the end. Eventually, he says, the Rolls-Royce line-up will probably include smaller, sportier vehicles - as it has in the past. But for now, with Rolls-Royce's attention focused on firmly establishing the marque's position in the market, BMW will not challenge the Continental. "Bentley is no longer in the high-end market, which is dominated by [Mercedes subsidiary] Maybach and Rolls-Royce," he insists. "Nobody talks about [the Bentley] Arnage anymore." But there are other segments outside the high-end markets where BMW is also conspicuously absent. Most notable is the fast-growing market for crossover vehicles, which combine the attributes of sports utility vehicles with the driving performance of cars - though Mr Panke says a BMW "non-crossover crossover" is forthcoming. 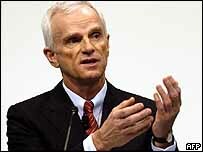 Mr Panke is clearly enjoying building the BMW empire. A suggestion that BMW is a German Mittelstand company - a reference to the way the billionaire Quandt family retains a 47% controlling stake in the firm after having rescued it from collapsing in 1959, when it was close to being taken over by Mercedes - sparks an annoyed response. BMW is one of the largest companies in Germany, and its market value is greater than that of the world's largest car maker, General Motors, Mr Panke points out. On top of that, he points out its contribution to the UK's economy. "The average UK tax rate of 22p would be 22.3p without BMW," he declares, citing BMW-commissioned research by Oxford Economic Forecasting. According to the research, BMW Group contributed £1bn directly to the UK economy in 2004, its car and engine exports accounted for 0.9% of total UK goods exports, and it has invested £900m in its production facilities in the past four years. "We are grateful, we are happy, to be part of UK PLC," Mr Panke says. Mr Panke is happy to talk to journalists about BMW's operations. But, he says, reciting a story about how a Munich newspaper recently wrote a rather banal story about him going to the cinema with his daughter and wife, he is also frustrated at the desire to focus on his persona and his private life. After all, who cares that he was born in Fuerstenwalde in the heart of Soviet-occupied East Germany, that he used to play the cello while at school in Bavaria, or that he bought his first car (a light blue Fiat 500) from his brother in 1969 while studying physics in Munich? Does anyone really want to know that he likes single malt whisky, but dislikes chocolate? Is it relevant that he goes jogging in the morning, that he enjoys skiing in the Swiss alps, or that he listens to both REM and U2 as well as Haydn and Bach? To Mr Panke, the answer is unambiguous. "What I eat for breakfast is not important," he says.